Copyright ©The Author(s) 2017. Published by Baishideng Publishing Group Inc. All rights reserved. Author contributions: Chung KT and Shelat VG contributed equally to Manuscript writing. Peptic ulcer disease (PUD) affects 4 million people worldwide annually. The incidence of PUD has been estimated at around 1.5% to 3%. Perforated peptic ulcer (PPU) is a serious complication of PUD and patients with PPU often present with acute abdomen that carries high risk for morbidity and mortality. The lifetime prevalence of perforation in patients with PUD is about 5%. PPU carries a mortality ranging from 1.3% to 20%. Thirty-day mortality rate reaching 20% and 90-d mortality rate of up to 30% have been reported. In this review we have summarized the current evidence on PPU to update readers. This literature review includes the most updated information such as common causes, clinical features, diagnostic methods, non-operative and operative management, post-operative complications and different scoring systems of PPU. With the advancement of medical technology, PUD can now be treated with medications instead of elective surgery. The classic triad of sudden onset of abdominal pain, tachycardia and abdominal rigidity is the hallmark of PPU. Erect chest radiograph may miss 15% of cases with air under the diaphragm in patients with bowel perforation. Early diagnosis, prompt resuscitation and urgent surgical intervention are essential to improve outcomes. Exploratory laparotomy and omental patch repair remains the gold standard. Laparoscopic surgery should be considered when expertise is available. Gastrectomy is recommended in patients with large or malignant ulcer. Core tip: The classic triad of sudden onset of abdominal pain, tachycardia and abdominal rigidity is the hallmark of perforated peptic ulcer. Early diagnosis, prompt resuscitation and urgent surgical intervention are essential to improve outcomes. Exploratory laparotomy and omental patch repair remains the gold standard and laparoscopic surgery should be considered when expertise is available. Gastrectomy is recommended in patients with large or malignant ulcer to enhance outcomes; however the outcomes of patients treated with gastric resections remain inferior. Peptic ulcer disease (PUD) results from an imbalance between stomach acid-pepsin and mucosal defense barriers. It affects 4 million people worldwide annually. The incidence of PUD has been estimated at around 1.5% to 3%. A systematic review of seven studies from developed countries estimated that the annual incidence rates of PUD were 0.10%-0.19% for physician-diagnosed PUD and 0.03%-0.17% when based on hospitalization data. Although 10%-20% of patients with PUD will experience complications, only 2%-14% of the ulcers will perforate causing an acute illness[4,5]. Perforation is a serious complication of PUD and patients with perforated peptic ulcer (PPU) often present with acute abdomen that carries high risk for morbidity and mortality. The lifetime prevalence of perforation in patients with PUD is about 5%. PPU carries a mortality ranging from 1.3% to 20%[8-10]. Thirty-day mortality rate reaching 20% and 90-d mortality rate of up to 30% have been reported[11,12]. In this review we have summarized the current evidence on PPU and we hope our review will assist surgeons updated with evidence based practice. Although previous studies have indicated that seasonal variation did influence the incidence of PPU, other studies have failed to prove such a pattern[13-16]. In developing world, patients tend to be young male smokers while in developed countries; patients tend to be elderly with multiple co-morbidities and associated use of non-steroidal anti-inflammatory drugs (NSAIDs) or steroid[17,18]. NSAIDs, Helicobacter pylori (H. pylori), physiological stress, smoking, corticosteroids and previous history of PUD are risks factors for PPU[1,19-27]. In the presence of risk factors, recurrence of ulcer is common despite initial successful treatment. A systematic review of 93 studies has shown that the average long-term recurrence of perforation was 12.2% (95%CI: 2.5-21.9). NSAIDs are widely used for its analgesic, anti-inflammatory and anti-pyretic effects. NSAID use is known to increase the risk of PPU[28,29]. About a quarter of chronic NSAID users will develop PUD and 2%-4% will bleed or perforate[30-33]. Drug interaction with steroids and selective serotonin reuptake inhibitors also increases the risks of PUD. Selective cyclo-oxygenase-2 inhibitors are less associated with PUD. A study in western Denmark showed that the standardized hospitalization rates for PPU reduced from 17 per 100000 population in 1996 to 12 per 100000 population in 2004 (HR 0.71; 95%CI: 0.57-0.88) after the introduction of selective cyclo-oxygenase-2 inhibitors into clinical practice. H. pylori remain one of the commonest infections worldwide. The prevalence of H. pylori has decreased in developed countries due to improved hygiene and reduced transmission in early childhood. The mean prevalence of H. pylori in patients with PPU varies between studies due to different diagnostic methods and geographical variations. Recent studies using histopathological methods of H. pylori detection have shown that H. pylori prevalence in patients with perforated duodenal ulcers ranges from 50%-80%[22,35]. A randomized controlled trial in 2008 involving 65 patients who underwent simple closure of a perforated duodenal ulcer showed one year ulcer recurrence rate of 6.1% in H. pylori treated patients as opposed to 29.6% in the control group. Recurrent PUD mainly occurs in patients with H. pylori infection suggesting that H. pylori play an important role in the development of PUD and its complications[22,37]. The risk of recurrent H. pylori infection is significantly reduced with proton pump inhibitor therapy, but proton pump inhibitors have only a modest efficacy for reduction in ulcers with NSAID users. Tobacco is thought to inhibit pancreatic bicarbonate secretion, leading to increased acidity in duodenum[38,39]. It also inhibits the healing of duodenal ulcers. A meta-analysis has indicated that 23% of PUD could be associated with smoking. However, in some studies, there was no difference in tobacco use between patients with non-H. pylori, non-NSAID duodenal ulcers and those with H. pylori related ulcers, indicating a limited role of smoking. This is in agreement with previous studies, which indicated that smoking did not increase the risk of ulcer recurrence once the H. pylori had been eradicated[42,43]. A study involving 72 patients investigated the genetic differences between H. pylori-positive and negative duodenal ulcer patients. DQA1*0102 allele were significantly more common in H. pylori negative patients. This study indicated that genotypes might influence the ability of the host to resist H. pylori infection. A study involving 228 patients indicated that steroid use prior to hospital admission was associated with two fold increase in 30 d mortality amongst patients admitted for PPU. Other risk factors may include excessive alcohol consumption and excessive acid production such as gastrinomas and Zollinger-Ellison syndrome (ZES)[18,46,47]. Alcohol consumption is known to damage gastric mucosa and stimulate gastrin secretion. Despite these acute effects, there is no evidence that alcohol causes PUD. ZES is caused by a gastrin secreting tumor of the pancreas that stimulates the parietal cells in stomach to increase the acidity, resulting in gastrointestinal mucosal ulceration. Over 90% of patients with ZES develop peptic ulcers and typically these ulcers are refractory to proton pump inhibitor therapy. ZES should be suspected in patients with multiple or refractory peptic ulcers, jejunal ulcers, family history of PUD and associated diarrhea. All patients with ZES should be screened for Multiple Endocrine Neoplasia 1 (MEN1) syndrome. In 1843 Edward Crisp stated that “the symptoms are so typical, I hardly believe that it is possible that anyone can fail in making a diagnosis”. Symptoms of PUD include abdominal pain, upper abdominal discomfort, bloatedness and feeling of fullness. When PUD worsen and eventually perforate, gastric juice and gas enters the peritoneal cavity leading to chemical peritonitis. Sudden onset of abdominal pain or acute deterioration of the ongoing abdominal pain is typical of PPU. Typically the pain never completely subsides despite usual premedical remedies and forces the patient to seek medical attention. The chemical peritonitis due to efflux of gastroduodenal contents and severe pain lead to tachycardia. The classic triad of sudden onset of abdominal pain, tachycardia and abdominal rigidity is the hallmark of PPU. The clinical manifestation can be divided into three phases. In the initial phase within 2 h of onset, epigastric pain, tachycardia and cool extremities are characteristic. In the second phase (within 2 to 12 h), pain becomes generalized and is worse on movement. Typical signs such as abdominal rigidity and right lower quadrant tenderness (as a result of fluid tracking along the right paracolic gutter) may be seen. In the third phase (more than 12 h), abdominal distension, pyrexia and hypotension with acute circulatory collapse may be evident. A study involving 84 patients with PPU reported that the commonest presenting symptoms were sudden onset of severe epigastric pain (97.6%), abdominal distention (76.2%) and vomiting (36.9%). Abdominal tenderness and classical signs of peritonitis could be elicited in 88.1% and 66.7% of the patients with PPU in this study. Other symptoms also included nausea (35.7%), severe dyspepsia (33.3%), constipation (29.8%) and fever (21.4%). In our experience of managing 332 patients with PPU, the most common presenting symptom was acute onset of abdominal pain (61.7%). A recent study in Taiwan has shown that patients with PPU were more likely to present to emergency room on weekends and this needs to be validated. Tachycardia and abdominal tenderness with rigidity are common clinical signs. Severe pain, systemic inflammatory response from chemical peritonitis and fluid deficit either due to poor intake or vomiting or pyrexia leads to compensatory tachycardia. In patients who delay seeking medical attention, hypotension ensues due to total body water deficit. If uninterrupted; this progresses to mental obtundation and acute kidney injury. This leads to a state where patient becomes physiologically unfit for operative intervention which is absolutely necessary. Hence it is important to establish prompt confirmatory diagnosis. An urgent erect chest X-ray and serum amylase/lipase is basic essential test in a patient with acute upper abdominal pain. In modern era it is not prudent to perform an exploratory laparotomy and establish a diagnosis of acute pancreatitis. Seventy-five percent of PPU have free air under diaphragm on erect chest X-ray. In our experience of managing 332 patients, erect chest X-ray revealed free air in 59.8% of patients. This variation could reflect the earlier presentation and easy access to healthcare locally. Sixty-one point seven percent of our patients presented within 24 h of onset of abdominal pain. In a patient with upper abdominal symptoms, free air on an erect chest X-ray establishes a diagnosis of PPU. In some patients, an abdominal X-ray may have been performed by emergency physician or primary medical team. It can show signs such as appearance of gas on both sides of the bowel wall (Rigler’s sign), a large volume of free gas resulting in a large round black area (Football sign) and gas outlining soft tissue structures such as liver edge or falciform ligament. It is authors’ practice not to perform an abdominal X-ray in patients with suspected PPU when chest X-ray does not show free air under the diaphragm. CT scan is recommended as it has a diagnostic accuracy as high as 98%. 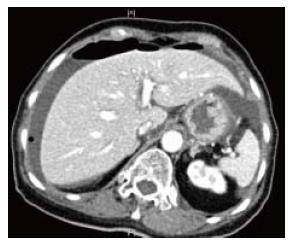 Besides, CT scan can exclude acute pancreatitis that would not need surgical intervention. CT scan is performed in supine position and free air is usually seen anteriorly just below the anterior abdominal wall. The falciform ligament can sometimes be visible when air is present on both sides. In resource poor healthcare facilities, oral gastrograffin can be used to diagnose PPU. Water-soluble contrast leaking into the peritoneal cavity can confirm the diagnosis of PPU. Absence of a leak does not exclude PPU as the perforation may have sealed off spontaneously. Barium study is contraindicated in gastrointestinal perforation and should be avoided as a tool to diagnose PPU. We consider lateral decubitis abdominal radiographs as obsolete and do not recommend. The traditional practice of instilling air via the nasogastric tube and repeating the erect chest X-ray after few minutes is not recommended except in resource poor facilities. It takes time and a repeat negative chest X-ray does not rule out the diagnosis of PPU and still a CT scan would be warranted. Rarely a CT scan is performed even when an erect chest X-ray reveals free air under diaphragm. The utility of this CT scan is justified when clinical presentation is not specific to upper gastrointestinal pathology or a malignancy is suspected and patients’ hemodynamics is not deranged. In patients with acute kidney injury, a non-contrast CT scan is adequate to see free air. Oral contrast with CT scan is a useful tool and if free leak is seen, diagnosis is certain (Figures 1 and 2). Figure 1 Computerized tomography scan shows free air under the diaphragm with peri-hepatic free fluid. 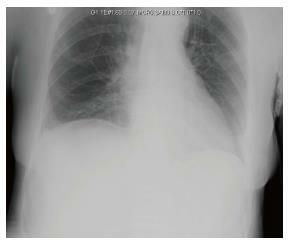 Figure 2 Erect chest X-ray image of the same patient with equivocal free air under the right hemidiaphragm. Laboratory tests are performed in PPU not to establish diagnosis but to rule out differential diagnosis and also to understand the insult to various organ systems. They are non-specific. Serum amylase should be done at index presentation to emergency unit or after a normal chest X-ray. Raised serum amylase may be associated with PPU and it’s usually raised less than four times its normal level. Tests such as white cell count and C-reactive protein may be done as part of the investigation in PPU. Leukocytosis and raised C-reactive protein may be raised as a result of inflammation or infection. Elevated creatinine, urea and metabolic acidosis reflects systemic inflammatory response syndrome (SIRS) and prerenal injury. Serum gastrin levels are indicated in patients with history of recurrent ulcers or recalcitrant PUD and can help establish diagnosis of Zollinger Ellison syndrome. In patients with suspected parathyroid disorders, serum calcium levels are indicated. PPU is a surgical emergency associated with high mortality if left untreated. In general, all patients with PPU require prompt resuscitation, intravenous antibiotics, analgesia, proton pump inhibitory medications, nasogastric tube, urinary catheter and surgical source control. Omeprazole and triple therapy for H. pylori eradication are useful adjuncts in treatment of PPU. Evidence has shown that omeprazole and triple therapy treatment reduces the recurrence rate significantly. Ulcer healing shown at 8-wk follow up with endoscopy was significantly higher in triple therapy eradication group. Eighty-five point three percent of ulcers were healed in the triple therapy group as opposed to 48.4% in the omeprazole alone group. Several other studies from different countries have also proven triple therapy eradication after simple closure of PPU reduced the incidence of recurrent ulcer[37,59,60]. It is our practice to prescribe intravenous proton pump inhibitor for 72-96 h and start oral triple therapy immediately after. We perform urea breath test to establish H. pylori eradication after completion of medical treatment. Studies have shown that about 40%-80% of PPU will seal spontaneously with conservative management and overall morbidity and mortality are comparable[2,61,62]. Conservative management “Taylor method” consists of nasogastric suction, intravenous drip, antibiotics and repeated clinical assessment. A gastrograffin dye study is essential to confirm absence of leakage in patients selected for non-operative management. If patients are clinically stable and improving, especially with a sealed perforation, surgery may not be warranted. However, if they deteriorate, regardless of the presence and size of the leak, urgent operation is indicated. A Randomized controlled trial involving 83 patients compared the outcome of non-operative treatment with that of operative intervention in patients with PPU. Cefuroxime, ampicillin and metronidazole were administered to all patients. Seventy-two point five percent (29/40) of patients in conservative group showed clinical improvement and were successfully managed without surgery. Covering with an appropriate antibiotic in patients with peritonitis is associated with an increased chance of resolution of the infection after primary surgery. Another study looking at 82 patients who were treated conservatively also showed that 54% of the patients (44/82) showed clinical improvement and did not require a surgical intervention. Study also suggests that patients do well without surgery if spontaneous sealing occurs. A study has shown that about 40% of PPU had no evidence of leak on upper GI contrast studies, indicating that the perforation had sealed off spontaneously. The mortality rate for non-operative management in patients with a sealed perforation was 3% as opposed to 6.2% where emergency surgery was performed for PPU. This suggests that PPU with a sealed perforation can be managed conservatively. The advantages of conservative management include avoidance of surgery, risks of general anaesthesia and post-operative complications. On the other hand, disadvantages include misdiagnosis and higher mortality rate if conservative management fails[61,66]. In clinical practice, non-operative management strategy is resource intensive and it requires a commitment of active regular clinical examination along with round the clock availability of a surgeon and if there is clinical deterioration, emergency surgery is warranted. The essential components of non-operative management of PPU can be grouped as “R”s: (1) Radiologically undetected leak; (2) Repeated clinical examination; (3) Repeated blood investigations; (4) Respiratory and renal support; (5) Resources for monitoring; and (6) Readiness to operate. Management of PPU is primarily surgical and different suture techniques for closure of the perforation are described. Johan Mikuliczradecki stated that “every doctor who is faced with a perforated ulcer of stomach or duodenum must consider opening the abdomen, sewing up the hole and averting a possible inflammation by a careful cleansing of the abdominal cavity”. In 1992, Feliciano also described 5 points of decision that surgeon needs to take into account. Those decisions include: (1) Is surgery indicated? (2) Is an omental patch sufficient or a definitive ulcer operation indicated? (3) Is the patient stable enough to undergo a definitive ulcer operation? (4) Which definitive ulcer operation should be done? (5) Should the availability of newer medical options influence the choice of operation? With the development of laparoscopic operation in the past few decades, a sixth decision point is proposed; and (6) Should the procedure be performed laparoscopically?[67,68]. Roscoe Graham described PPU to be not a local disease but a local manifestation of a constitutional disturbance. There are many operative methods that could be used to treat PPU. Primary closure by interrupted sutures, closure by interrupted sutures covered with a pedicled omentum on top of the repair (Cellan-Jones repair) and plugging the perforation with a free omental plug (Graham patch) are the most common techniques. Vagus nerve plays an important role in the regulation of gastrin release and gastric acid secretion by stimulating parietal cells via cholinergic receptors. Vagal stimulation also releases histamine and gastrin from enterochromaffin like cells and G-cells, which in turn, will stimulate the parietal cells to produce acid secretion. Vagotomy is a procedure that transects the vagal trunks (truncal vagotomy) or distal nerve fibers (highly selective vagotomy). Truncal vagotomy aims to reduce the gastric acid secretion, thus reducing the risks of recurrent PUD. Selective vagotomy, which spares the hepatic and celiac divisions of the vagal trunks, are associated with higher long-term recurrence rates. Therefore, selective vagotomy is no longer performed. Studies have shown that the ulcer recurrence rate was as high as 42% in perforated duodenal ulcer patients who underwent simple omental patch repair[72,73]. Few prospective randomized studies also reported substantially less ulcer recurrence in patients who underwent vagotomy in addition to omental patch repair[37,74]. Nonetheless, vagotomy is now seldom performed for PPU due to the availability of medications such as histamine receptor antagonists, proton pump inhibitors and H. pylori eradication. Rydiger did a partial gastrectomy for the management of PUD in 1880. Unfortunately, it was not successful. A year later, Theodor Billroth performed a successful gastroduodenostomy in a 43-year-old woman with pyloric cancer. He was the first surgeon who did gastric resection for antral carcinoma. Nowadays, emergency gastrectomy is reserved for a giant ulcer or a suspicion of malignancy when it is not safe to perform omental patch repair. A retrospective study reported a mortality rate of 24% in 41 patients who underwent gastrectomy for perforated benign gastric ulcers. A study comparing outcomes after gastrectomy and simple closure repair showed that there were no significant differences in patient recoveries. Longer operating times, ventilation and postoperative blood transfusion are associated with increased mortality. The larger size of perforation is associated with higher mortality and post-operative anastomotic leak. In a study of 601 patients and including 62 patients treated with gastric resection, we have shown that serum albumin is the only preoperative factor predictive of mortality (OR 5.57) and outcomes of patients treated with gastric resection are inferior as compared to omental patch repair with mortality risk of 24.2%. Gastric resections for acid reduction have become less favorable after proton pump inhibitors era and in our experience, up to 10% of PPU patients require gastric resection. Laparoscopic repair was first performed for a perforated duodenal ulcer in 1990. Laparoscopic repair of PPU is believed to reduce the post-operative morbidity and mortality. A recent systematic review of 3 randomized controlled trials with a total of 315 PPU patients compared laparoscopy with open surgery. This study failed to demonstrate differences in abdominal septic complications, pulmonary complications, mortality and re-operation. However, the operative time was shorter in laparoscopic group in contrast with previous study. A systematic review of 56 studies comparing laparoscopic vs open approach for PPU concluded that there was no consensus on the perfect operating techniques. The overall conversion rate for laparoscopic surgery was 12.4% mainly due to the size of perforation. Ulcer size more than 9 mm is a significant risk factor for conversion to open surgery. The operating time was longer and recurrent leakage was higher in laparoscopic group. However, the laparoscopic group also showed less postoperative pain and a shorter hospital stay. Furthermore, the laparoscopic treatment is also associated with equivalent costs compared with the open surgery as it reduces duration of hospital stays. The current evidence remains poor for choosing laparoscopic repair over open surgery for PPU. This review has suggested that patients with a Boey score of 3, age over 70 years and symptoms lasting longer than 24 h should have open surgical approach as these patients have higher morbidity and mortality. Laparoscopic repair of PPU has now been performed by trainee surgeons with acceptable results[90,91]. Our local experience also showed that strict selection such as Boey score of 0-1, ulcer size of less than 10 mm, ulcer located in pyloro-duodenal area, haemodynamic stable, no previous abdominal surgeries, not suspected malignant ulcer and excluding ASA 3 and above score were safe for training. There were no conversions, complications or mortality. Laparoscopic repair techniques mirror techniques of open surgery and in particular sutureless techniques are more prominently described. This may in part due to training in intra-corporeal knotting skills. Sutureless techniques involve gelatin sponge plug with fibrin glue sealing or endoscopic clipping. A recent study has compared the effectiveness of a sutureless onlay omental patch with a sutured omental patch method. Forty-three patients underwent laparoscopic repair of PPU with sutureless onlay omental patch and another 64 patients underwent laparoscopic repair of PPU with sutured omental patch. There were no leaks in either group. The operating time and length of stay were significantly shorter in sutureless onlay omental patch group. This study has indicated that both techniques are safe and effective for repair of PPU. Trainees can easily perform laparoscopic sutureless repair with limited experience in laparoscopic surgery. Laparoscopic gelatin sponge plug and fibrin glue sealing can be easily performed. However, this technique has not been widely accepted as it has been reported to have a higher leak rate. Endoscopic clipping of PPU is not widely practiced, as there are only few centers with technical expertise and experience is limited with reports showing high complications and mortality[96,97]. “Dilution with solution is the solution to pollution”. Towards the end of surgery, some surgeons like to irrigate the peritoneal cavity with 6-10 litres and even up to 30 litres of warm saline although no evidence has been found in literature to support that irrigation can lower the risk of sepsis[98,99]. On the other hand, pneumoperitonuem induced during laparoscopic surgery may increase the risk of bacterial dissemination. It also seems to be a surgeon’s preference whether or not to leave a drain at the end of surgery. There is no evidence to support that leaving a drain in can reduce the incidence of intra-abdominal collections[101,102]. On the contrary, it may lead to infection of drain site and increased risk of intestinal obstruction. A questionnaire performed by Schein showed that eighty percent of the surgeons did not leave a drain in after surgery due to the reasons discussed above. Nowadays, the tire test (watch for bubbles after submerging patch repair under water) and the dye test (to inject dye via nasogastric tube) to look for leakage after closure of PPU are rarely used (Figure 3). Figure 3 Shows laparoscopic omental patch repair. A: Anterior duodenal perforation; B: Laparoscopic suturing; C: Omental patch; D: Abdominal drain placement. Primary stenting and drainage may be used as new treatment option for PPU. Eight patients with PPU were treated with self-expandable metal stents. Two patients were treated with stenting due to postoperative leakage after initial surgical closure and six patients were treated with primary stenting. Seven out of 8 patients recovered without complications and were discharged 9-36 d after stenting. Another study involving 10 patients with PPU who were treated with stenting also showed good clinical results. This study has indicated stent treatment as a minimal invasive alternative with fewer complications compared to surgical treatment. These studies indicate that patients with PPU may be treated with primary stenting and drainage where training and expertise is available. More data is required to prove the effectiveness of this method. Any form of gastroenteric reconstruction can lead to the development of ulcer at the margins of the gastrojejunal anastomosis, known as marginal ulcer. The incidence of marginal ulcer is around 1% to 16%[105,106]. The ulcer tends to develop on the jejunal side of the stoma since it is directly exposed to the gastric acid. Local ischemia, NSAIDS, anastomotic tension, chronic irritation due to the suture material and duodenal reflux are implicated in the aetiopathogenesis of marginal ulcer. Marginal ulcer can rarely lead to perforation. The presentation of patients with marginal ulcer perforation should be similar to PPU, however it may not be so. The small bowel contents has increased bacterial load and will also neutralize the gastric acid. A prospective study has shown that 28% of patients with marginal ulcers were asymptomatic. Operative management for marginal ulcer perforation includes anastomotic revision such as converting Billroth II gastro-jejunostomy reconstruction into a Roux-en-Y. It can also be treated with simple omental patch repair[109,111]. In recent time, majority of the published studies describe marginal ulcer and its perforation following bariatric procedures. We have reported a series of nine patients with marginal ulcer perforation following previous gastric resections for benign and malignant diseases. We have concluded that patients with marginal ulcer do not present with septic shock. Also, revision of Billroth II gastro-jejunostomy to Roux-en-Y anastomosis is not mandatory and omental patch repair is sufficient. PPU treatment is associated with a significant postoperative morbidity and mortality regardless of whether laparoscopic or open repair is performed. Post-operative mortality for PPU is estimated to be 6%-10%. Age more than 60 years old, delayed treatment greater than 24 h, shock at presentation with systolic blood pressure less than 100 mmHg and concomitant diseases are the main risk factors influencing outcome[2,115]. Post-operative mortality in elderly is 3 to 5 times higher. This may be due to the presence of medical comorbidities, delayed presentation, atypical presentation or delay of > 24 h in diagnosis. Post-operative complications have been reported at around 30%[50,117]. Complications after surgical closure of PPU include surgical site infection, pneumonia, intra-abdominal collection/abscess, wound dehiscence, enterocutaneous fistula, peritonitis, incisional hernia and ileus. A study has shown the commonest post-operative complications were surgical site infections (48%) and pneumonia (28%). However, this study only involved 25 patients and may not be representative. A more recent study involving 726 PPU patients between 2011 and 2013 in Denmark indicated the most common post-operative complications were post-operative leak (5.9%) and wound dehiscence (4.7%). Around 1 in every 5 patients underwent re-operation due to post-operative complications. This study also indicated that laparoscopic repair was associated with lower risk of re-operation than laparotomy or laparoscopic surgery converted to open surgery. Another study assessing postoperative complications in 96 patients reported that a total of 29 patients developed a total of 50 events of postoperative complications. The most common complications were surgical site infection (32%), respiratory complications (30%), wound dehiscence (12%) and postoperative fistula (8%). Each additional complication was estimated to prolong hospital stay by 1.25 d. This study also reported that age > 40 years, larger size of perforation and history of shock significantly increased the rate of postoperative complications. In our local study involving 332 patients who underwent surgery for PPU, post-operative complications included intra-abdominal collection (8.1%), leakage (2.1%) and re-operation (1.2%). Intra-abdominal abscess remains a serious postoperative complication after PPU surgery. Therefore, good surgical technique must be adopted to prevent this complication. Our low leak rates (2.1%) could be explained by early presentation, prompt diagnosis, early resuscitation and appropriate surgery. Our data on 30 d mortality was 7.2% which is comparable to a recent study from South Korea. The lower mortality in our local study could be due to younger age (54.7), less co-morbidity (16.2%) and less patients with pre-operative shock (7.2%). A recent study looked at the association of mortality with out of hours admission in patients with PPU. A total of 726 patients who were surgically treated for PPU were included in this study. This study did not show statistically significance between 90-d mortality and out-of-hours admission in patients surgically treated for PPU. In order to allocate resources appropriately and provide optimal care, it is important to stratify patients into low and high risk of mortality. There are many scoring systems available to predict the mortality. About 11 different scoring systems used to predict outcome in PPU can be identified through the literature: the Boey score, the Americal Society of Anesthesiologists (ASA) score, the Sepsis score, the Charlson Comorbidity Index, the Mannheim Peritonitis Index (MPI), the Acute Physiology and Chronic Health Evaluation II (APACHE II), the Simplified Acute Physiology Score II (SAPS II), The Physiology and Operative Severity Score for the Enumeration of Mortality and Morbidity Physical Sub-score (POSSUM-phys score, the Mortality Probability Models II (MPM II), Peptic Ulcer Perforation (PULP) score, the Hacettepe score and the Jabalpur score. Amongst these 11 scoring systems, the Boey score and ASA score are the most commonly validated systems[8,80,122-124]. Other scoring systems are not widely used due a lack of validation or their complexity in clinical use. We have validated ASA score, Boey’s score, MPI and PULP score and found that all the four systems have moderate accuracy of predicting mortality with area under the receiver operator curve of 72%-77.2%. In a recent study including 148 patients from two university affiliated hospitals in Singapore, Lee et al has reported that in selected patients with presentation within 48 h and ulcer size < 2 cm, laparoscopic repair reduces length of hospital stay compared to open surgery in patients with MPI > 21. A recent study was looking at 62 patients who underwent emergency surgery for PPU. This study was investigating the correlation between the amount of peritoneal fluid and clinical parameters in patients with PPU. Using the methods described by Ishiguro et al, it was possible to predict the amount of accumulated intraperitoneal fluid by CT scan. This study has shown that the method of Ishiguro et al was useful for predicting the amount of intraperitoneal fluid in patients with PPU. It is believed that it will be useful for predicting the severity of postoperative complications and also helpful for treatment decision-making (Figure 4). 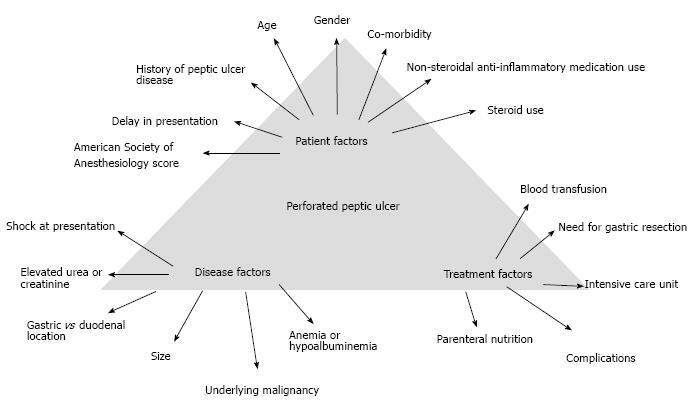 Figure 4 Determinants of outcomes in patients with perforated peptic ulcer. Mortality is a serious complication in PPU. As we mentioned before, PPU carries a mortality ranging from 1.3% to 20%[9,10]. Other studies have also reported 30-d mortality rate reaching 20% and 90-d mortality rate of up to 30%[11,12]. Significant risk factors that lead to death are presence of shock at admission, co-morbidities, resection surgery, female, elderly patients, a delay presentation of more than 24 h, metabolic acidosis, acute renal failure, hypoalbuminemia, being underweight and smokers[11,127-131]. The mortality rate is as high as 12%-47% in elderly patients undergoing PPU surgery[132-134]. Patients older than 65 year-old were associated with higher mortality rate when compared to younger patients (37.7% vs 1.4%). A study involving 96 patients with PPU also showed that there was a ninefold increase in postoperative complications in patients with comorbidities. In another large population study, patients with diabetes had significantly increased 30-day mortality from PPU. PUD can now be treated with medications instead of elective surgery. However, PUD may perforate and PPU carries a high mortality risk. The classic triad of sudden onset of abdominal pain, tachycardia and abdominal rigidity is the hallmark of PPU. Erect chest radiograph may not establish the diagnosis and an index of suspicion is essential. Early diagnosis, prompt resuscitation and urgent surgical intervention are essential to improve outcomes. Non-operative management should be conducted by experienced teams with optimal resources and ideally under trial conditions. Exploratory laparotomy and omental patch repair remains the gold standard and laparoscopic surgery should be considered when expertise is available. Gastrectomy is recommended in patients with large or malignant ulcer to enhance outcomes; however the outcomes of patients treated with gastric resections remain inferior. Gelatin sponge plugs, fibrin glue sealants, self-expandable stents and endoscopic clipping techniques deserve to be tested in a controlled trial setting.